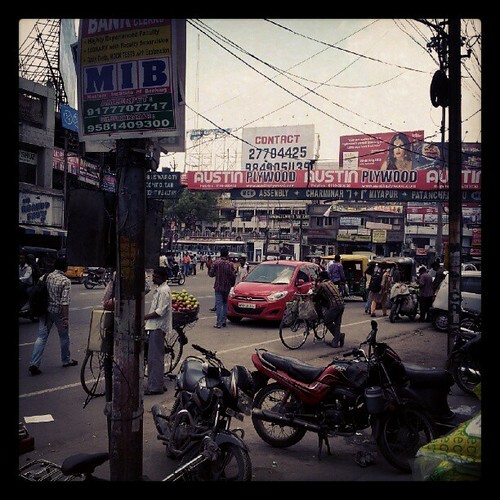 It has been a year since my last visit to Hyderabad and the difference in the traffic this visit is noticeable. The ride from the airport was smooth with the PV Narasimha Rao Expressway and I stay in the Ameerpet area and last year the area was always jam packed and the difference was noticeable. The traffic peak hours in areas like Hyderguda, Somajigud, Begumpet , Tarnaka was more orderly and travel time was reasonable. I am impressed with the way the Hyderabad Traffic Police is using technology and tools to make traffic better. Cameras to catch red light runners and those abusing one way traffic rules. Traffic Policemen themselves : Standing in the heat, dust and noise, I find more of the Traffic Policemen at choke points and actually standing and directing traffic and there seem to be more than one at each major intersection. It appears that one way streets and traffic medians are intact. I would have expected a break in the medians and influenced by political and regional influences. Improved e-challan system - Jay Mehta writing in betterindia.com says that that e-challan system has been improved in 2012. It also seems that the local "feet on the ground" police personnel seem to be more empowered to increase lane direction when necessary. The enforcement and increasing awareness of the evils of drunking and driving is also commendable. Rightfully the Hyderabad Traffic Police is focusing on Facebook over Twitter(https://twitter.com/hydtraffic) which matches the pattern of the usage of Facebook more in India. Kudos to the new sheriff in town who is behind the enforcement of rules to make the traffic better in Hyderabad. I have no clue who it is . Do you know?